Should I Combine Dental Implants & Dentures in Grafton? Are you one of many Americans that have missing teeth? It’s good to know that you’re not alone, but it’s better to know why it’s important to replace those missing teeth! Moreover, it’s critical to understand which dental prosthetic will work best and give you that long-lasting permanent replacement for years to come. Most people might assume that if you have severe tooth loss, you must turn to dentures in Grafton, but what if we told you that you have an even better, natural looking and feeling option? Read on to find out more information! When it comes to replacing teeth, it’s best to complete thorough research to compare and contrast your options. Ask your dentist about teeth replacement in Grafton, especially when it comes to deciding between dentures and dental implants. Dentures are a tried and true way of replacing teeth, but they do have a few drawbacks. Dentures essentially lay over your gums and act as your real teeth to make it easier to chew, speak, and avoid that sagging facial appearance that comes with missing teeth. New advancements allow dentures to look more natural, while offering a more secure fit for less discomfort and slipping. You’re able to eat and speak just as you would your natural teeth. Just remove your dentures or easy cleaning. The only thing that dentures can’t do is replenish your jawbone or stimulate it for new growth. When you lose teeth, you lose your vital tooth root below the gum line. Continue reading to learn how a dental implant can replace teeth from root to crown. The amazing thing about dental implants isn’t their ability to replicate the crown of your teeth, it’s the titanium post that’s implanted into your jaw. This is the post that replicates the root of your tooth. 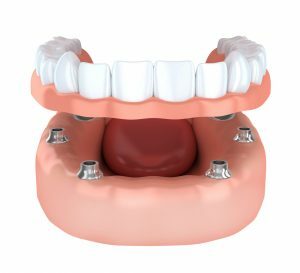 Although dentures do a great job of helping you restore your smile for periods of time, dental implants are a more permanent solution that anchor various prosthetics—including dentures—to your jaws. Implant retained dentures are constructed similarly to removable dentures. They’re created with a natural looking pink gum line that support your replacement teeth. However, they are held in place using the dental implants. Since the dentures are held in place by posts, they can easily snap on and snap them off when you need to clean them. You simply care for your replacement teeth as you care for natural teeth. There are no slipping, discomfort, or food restrictions because they’re stabilized after your full healing period. Another great benefit is that implants not only stop bone loss, but actually stimulate new jaw bone growth! When it comes to replacing critical parts of your body, like teeth, we believe you should have options and pick the best route for you. Ask your dentist for advice. Your dentist’s favorite part of his job is helping patients improve and love their smiles again. That’s why Dr. Joe Kern will work closely with a specialist to have your teeth replaced with dental implants and personally help craft your dental prosthetic. If you would like to speak with Dr. Kern, reach out to our Grafton office. Comments Off on Should I Combine Dental Implants & Dentures in Grafton?